Worksite Hawk: Management and Security Made Easy! The Worksite Hawk is a revolutionary management and security tool that’s easy to use! Since its introduction, the Worksite Hawk has a new standard for its class. 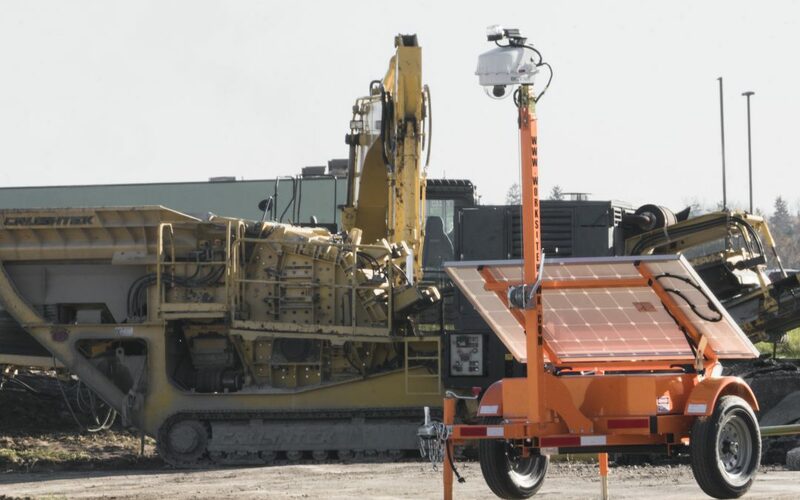 Equipped with a PTZ camera and controlled through a user-friendly interface, it provides managers and owners a 24/7 eye on the jobsite. 200 days’ worth of footage is stored, so everything’s on the record, while advanced software identifies suspicious activity and notifies you instantly. The Worksite Hawk might be a sophisticated piece of technology, but it’s designed with the operator in mind. Its compact size leaves a small footprint on the jobsite while also making transportation economical and hassle free. Setup is a snap, with drop leg jacks that eliminate the need for blocking, as well as a cable winch for near-effortless deploying of the camera through the telescoping mast. Wiring is internal, so it’s protected from hazards such as vandalism or weather, while the solar-power and battery bank eliminate the need for plug-in power or any battery maintenance, ever. Just deploy the Worksite Hawk and use it! For a live FaceTime or Skype demonstration of the Worksite Hawk’s capabilities, call us at 319-415-1226 or email us at sales@CrossroadsMfg.com.